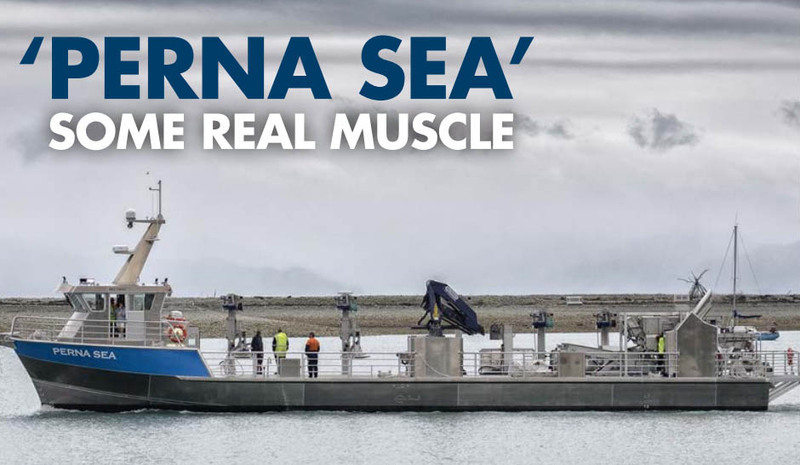 To the untrained eye, many of the recent mussel harvester vessels to have been built look very similar, but there are many variations, mostly brought about by owner’s preferences. 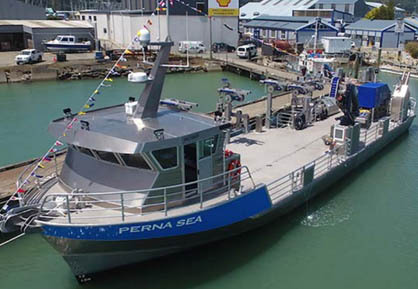 Perna Sea’s owner Peter Bull and his crew had thought the layout through very carefully, opting for a forward wheelhouse and aft harvesting station with a lowered deck platform to reduce the lift height for the product. The ‘fore and aft’ layout is ideal as it allows the product to be stored amidships. The discussion around overall dimensions hinged on the efficiency of the hull in various modes, and it was decided in the end to keep the vessel rather slimmer than similar harvesters of that length with the aim of reducing wave-making. That seems to have been successful. Mussel harvesters of near 30 metres tend to have a beam of around eight metres which allows six bags of product across the deck. Peter Bull opted for a beam of 7.25 metres, allowing five bags (plus access) across the deck, but the vessel is still capable of a payload in excess of 90 tonnes. With the advent of modern harvesting Perna Sea equipment the aft end of the deck is crowded with machinery. 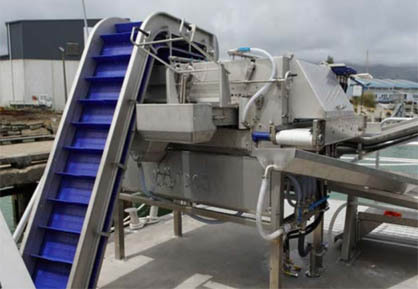 The standard de-clumper and washer are supplemented by a size grader and a colour grader and their associated conveyors and baggers. Below decks the vessel is equally crowded, but laid out in a logical way allowing access to all machinery. The colour grader meant the inclusion of a large compressor, and the rest of the equipment places a huge hydraulic demand requiring large oil storage and cooling capacity. The twin engine and keel configuration is quite common on harvesters of this size, and is probably the best compromise for vessels required to carry large loads into shallow ports. Two 405kW diesel main engines paired with ZF gearboxes offer a top speed of 16 knots. At her cruising speed of 12 knots she has a range of 1,500nm. 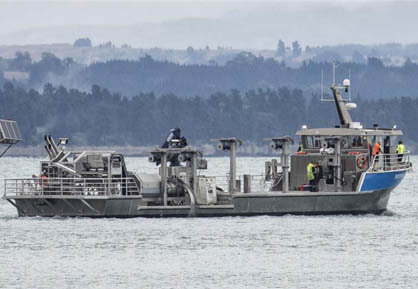 A 345kW auxiliary engine and a 60kW genset provide power to the hydraulic and electrical systems whilst a pair of Wesmar tunnel thrusters installed in the bow assist with maneuverability.